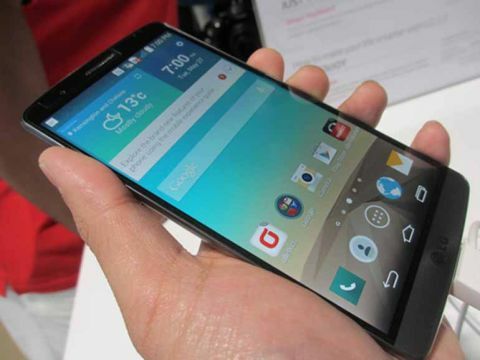 LG G3 hands on review | What Hi-Fi? When the LG G2 smartphone launched, it was one of the most promising smartphones we’d seen from LG for years. With a well thought-out design and some exciting world-first features (including high-res music capabilities), the G2 was a worthy rival to the flagship smartphones of all the big players, and in many cases, capable of beating them too. As such, the launch of the LG G3 has been surrounded by a suitable amount of internet hype and excitement, included numerous leaks, and even some information released from LG itself, just to whet our appetite. But it wasn’t until today that we actually got to get our hands on it at its official launch in London. Here are our first impressions of the LG G3. The display on the LG G3 really is something to put on your to-see list. The 5.5in screen (up from 5.2in on its predecessor) that dominates the front of the G3 is a Quad HD screen, offering four times higher resolution than that of standard HD and 1.8 times more than full HD. That means a resolution of 2560 x 1440 and a whopping 538ppi. We’re aware there’s an argument that the human eye can’t see any difference in screens over 300ppi, but after seeing the G3 display, we’d have to say we disagree. In terms of screen technology, the G3 uses an IPS (in-plane switching) display, which LG says will offer a 2.7x crisper image than a full HD AMOLED screen. The result? It looks great. The level of detail is something of a revelation, and colours are nicely balanced. Images are super-sharp and reading text on web pages is much less of a chore than you might be used to. Viewing angles are superb too, not losing any vibrancy of colour or deepness of blacks when viewed off axis. The difference in fine detail and colour accuracy was noticeable when compared with the G2, and that was a screen we really loved. We can’t wait to put the G3 through our vigorous video testing in our full review. To go along with its “simple is the new smart” tagline, the LG G3 features a very minimalist design. With a metallic-look back panel (that had us fooled as being the real deal until we spoke to an LG rep), there are no buttons to blemish its front or sides, with the back being the bearer of the same rear button controls we saw debuted on the LG G2. Below is a picture of it compared with the very obviously plastic back of the LG G2 - we much prefer the finish of the G3. These have been tweaked slightly from the originals, with the volume buttons larger and with a textured feel for easier usability, while the plastic power button has been ditched in favour of a circular metal design instead. Picking it up, we were surprised at how good it felt to hold, especially considering the size of its large display. At 74.6mm across though, it’s only around 4mm wider than the G2, and is complemented by a gently curved back panel that has been researched to find the ideal radius for maximum ‘gripability’. We’re pleased to say that it’s been successful. Despite being a touch larger than the G2, it feels just as easy to handle. Those taking the jump from an iPhone 5s, however, may still need some time to adapt. Other specs include 16GB on board storage with 2GB of RAM, or a 32GB variant with 3GB of RAM. LG says it is likely to offer the 16GB version in the UK to begin with, though the 32GB may be available later after launch. Unlike its predecessor, the back panel of the G3 is removable to reveal a 3,000mAh battery and microSD card slot, offering expandable storage up to 128GB (though it is futureproofed up to 2TB once it becomes available). The unexpandable nature was one of our niggles with the G2, so we’re glad that LG has addressed that here. The LG G3 will be available in five colours – black, white, gold, a maroon-like red, and a purpley-blue. They’re technical terms, of course. LG’s user interface has had an overhaul to match its simplicity message, doing away with fancy transitions and icon drop shadowing in favour of a flatter design. Colours are much more low key too, replacing bright and in-your-face primary hues with a “more mature” colour palette, with text kept light and crisp for ultimate readability. It’s a lot less tiring on the eyes than our first encounter with iOS 7. Flicking our way around the menus we’re really quite taken with it – it’s quick and responsive, and is certainly a pared back affair, though that’s not a bad thing. Simple enough to rival iOS, we prefer it over the original G2 experience, which was arguably a little too cluttered out of the box. This seems a lot neater and ready to go. As we’d predicted from the teaser promo video, the LG G3 places quite an emphasis on providing a decent camera for taking snaps on the go. Perhaps the headline feature of the 13MP snapper is its laser autofocus, which should make waiting for a shot to come into a focus a thing of the past. LG says this is a feature you’ll only really see in high-end SLR cameras, and is similar to the technology that police use in their speed guns. The crux of it is, it will take just 0.276 seconds to focus on an object, which, when you think the human eye blinks at 0.3 seconds, is pretty fast indeed. Even better, the G3 allows you tap on the focus area to both focus and take the photo in one, also packing an enhanced optical image stabilisation offering a 20% improvement over the G2. We put it through its paces and found the focus to be lightning fast. There’s an automatic multi-point focus, which worked as soon as we pointed the camera at a target. And when that target moved out of the way, the focus shifted on cue. Factor in the optical image stabilisation (OIS) and it’s now a lot easier to take snaps quickly. Compared to images taken on the G2, pictures are cleaner and sharper, with higher levels of detail and a better handling on contrast. The test shots below were both taken on automatic mode – the G2 on the top and the G3 on the bottom – we look forward to putting the camera through its paces in our full review. As much as it makes us cringe to type it, LG has declared the G3 as “the ultimate selfie cam”, with a 2.1MP lens, larger sensor and features such as the ability to simply raise your hand to take the snap. LG didn’t want to forget video either, and has included the ability for 4K filming, as seen on the G Pro 2. LG has also focused its efforts on improving video sound, with the ability to assess the ambient noise levels and choose the best settings for its environment. The LG G3 will support high-resolution music tracks like the LG G2, with LG noting that this makes much more sense in the G3 thanks to its expandable storage. Unfortunately there was no music pre-installed on the G3’s on display at the launch event, so we’ll have to wait and see how it fares in our full review. There are a handful of smart features worth mentioning, all built into the user interface that aim to make the user experience simpler. Smart Notice is a recommendation feature built into the phone, which doesn’t aim to replace current services, such as Google Now, but complement them. This means offering tips and suggestions based on user information – such as reminding you to return calls or add contacts – as well as helping you keep your G3 clutter free with suggestions on what apps and files you might want to delete based on those you haven’t used recently. The lowly keyboard has been given some attention in the G3, since LG felt it was something that is often overlooked, despite being one of the most key parts of the user experience. This means access to much more customisation, such as increasing or decreasing the height of the keyboard, UI tweaks so you are moving your fingers around the keyboard less, and the ability to memorise where you tend to hit keys, which LG says will help to reduce input errors by more than 75%. Finally, LG has thought about security. Alongside Content Lock, which allows you to lock down personal information with a separate password, and Kill Switch, which allows you to remote lock and remote wipe your phone should you lose it, Knock Code offers a new way to unlock your phone, while protecting it too. Building on from the Knock On feature debuted on the G2, which woke the screen from standby by tapping the screen, Knock Code effectively cuts out the lock screen, allowing you to create a pattern of between two and eight taps in place of a numerical PIN – giving you access to your phone straight from the standby screen. LG says this allows for over 84,000 combinations, making it much more secure than a regular PIN code. You can enter your Knock Code wherever you like on the screen, and when we used it, it was responsive and effective each time. The LG G3 looks very promising indeed, combining design and usability, with innovative features and useful improvements on its predecessor. It’s too early to tell how it’ll fare against our current favourite Android smartphone, the Sony Xperia Z2, but we very much look forward to finding out.